“I’ll get married when I’m 27”, Karim confidently exclaims. 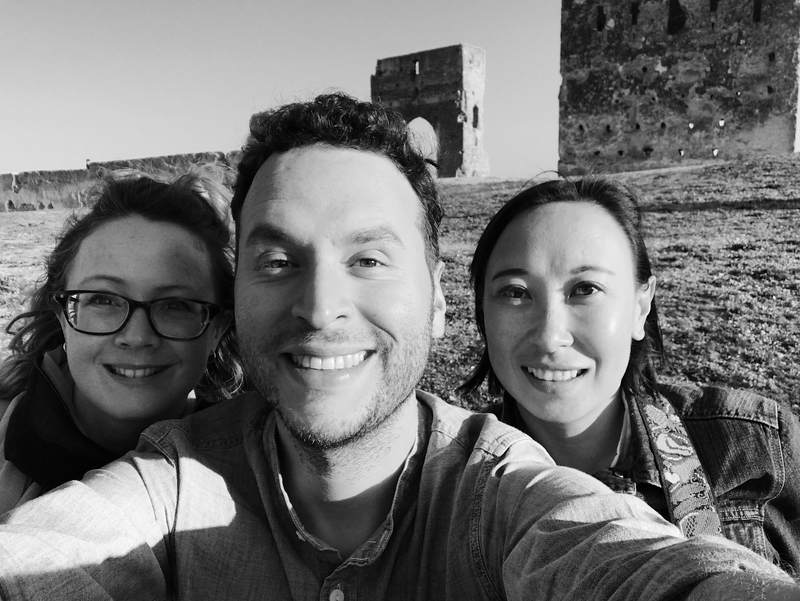 We are sitting by the roadside – myself and friends Lisa and Daniel, with our young Berber guide Karim. He’s just poured us some mint tea and shown us how to partially melt large chunks of sugar into it like a pro, and it’s a lesson we are happy to learn – it turns out we’ll be drinking a lot of it during the next eight days. 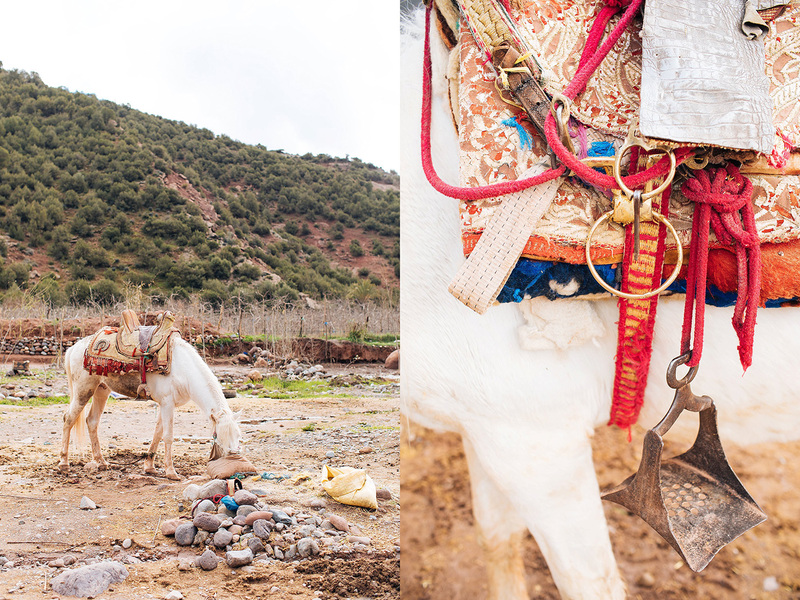 We’re waiting for our camels to be ready – part of the Atlas Mountains tour we are doing for the day – and we are peppering him with questions on what it’s like to grow up in Morocco. I really want to ask him how he can be so sure that the right person will come around at the right age. But then again, I already know the answer. Our driver Abdul is a close friend from the same village, someone he has known his whole life. He works alongside his own family in the tourism industry. For him, it won’t be endless swiping on dating apps to find the woman of his dreams. I know he’ll find her (and she’ll find him) amongst the close-knit community he is part of. I’m kinda jealous. My camel. I can’t remember her exact name, but I know it rhymed with Shakira, so let’s just call her that. There are horses too, if you don’t find a camel that takes your fancy. 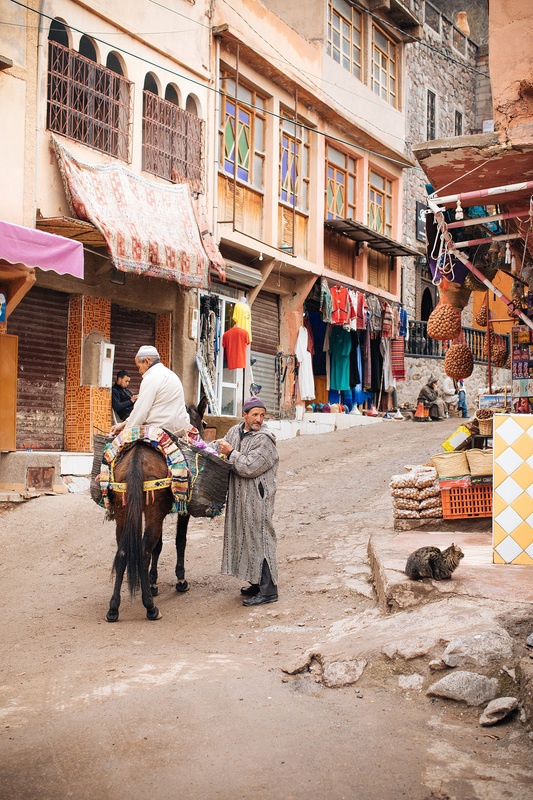 It’s our third day in Morocco and after quickly realising that the Moroccans are private people who do not always relish a tourists gaze upon them, we are eager to talk to a local about his life, his country, and his customs. We get the odd glimpse into his world. We walk through his village and see how everyone greets him on the street. A neighbour also screams at him for a time and waves a cellphone around. Not sure what that was about, but we’ve all had one of *those* neighbours, I’m sure. We wave to his sister perched on a nearby rooftop terrace and he tells us she is deaf – she waves back shyly. Karim asks the musician next to us to sing one of his favourite traditional songs. We don’t understand the lyrics of course, but he smiles and claps his hand to the beat of the Ahwach, singing along to a song about the legendary Fatimah. As we drive, our guide cues up the latest Ed Sheeran single on his smartphone (one of just 5 songs on there, it seems), and we sing along as we pass shepherds with flocks of sheep. Baby goats scamper everywhere. Big trucks are laden down with brush. Life is happening. I make the mistake of being a bit too enthusiastic in my singing, and we are rewarded by hearing the same song 6 more times on the hour-long drive home – it was to become an ear worm that does not leave me for the next 7 days. No complaints here. Love that song. My friends? Maybe not so much (…now). 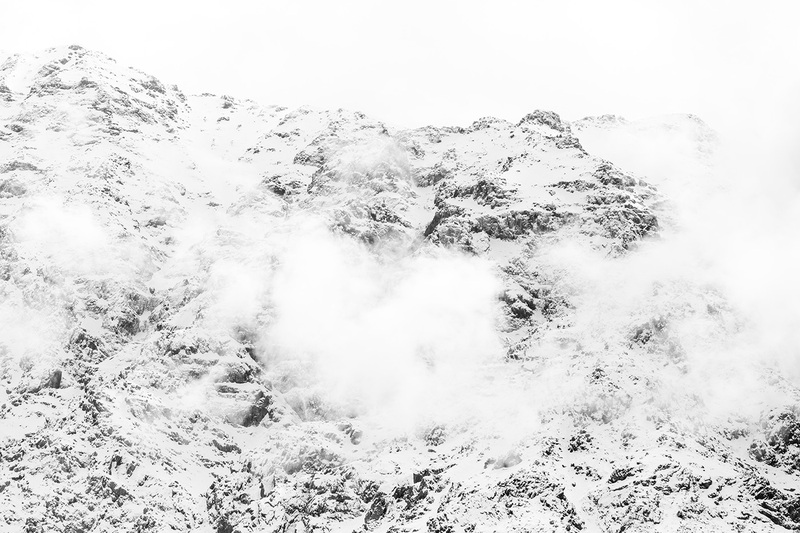 It’s late February and we were surprised to see just how much snow is still on the mountains. 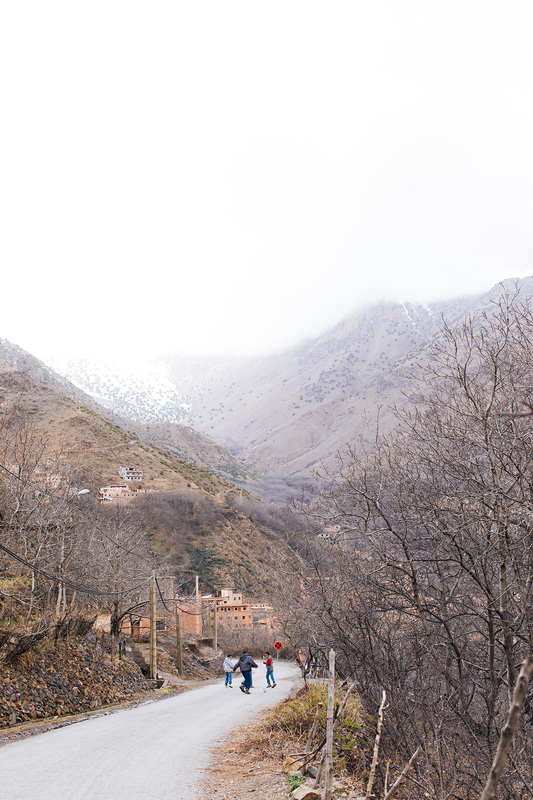 As we drive our way up to Ait Souka and the village of Imlil, the highest mountain in Northern Africa looms before us, and we are dumbfounded. Just an hour and a half ago we were in palm-tree filled Marrakech. Granted, being late-February it wasn’t boiling hot, but it was still balmy, and here I am wishing I’d perhaps brought my wooly hat. Our lunch on the roof terrace is moved inside to a room kitted out with a long table and cosy benches, and a mountain of blankets. A gas heater is perched on the table in front of us, the open window is deftly covered with a tarpaulin, and through another, we watch the light snow falling outside. The contrast between the high Atlas and the lower approach. Honestly I wish I knew how they made those lentils, because they were the best I’ve ever had. Feasting whilst watching the snow fall. Children playing in the village of Imlil. 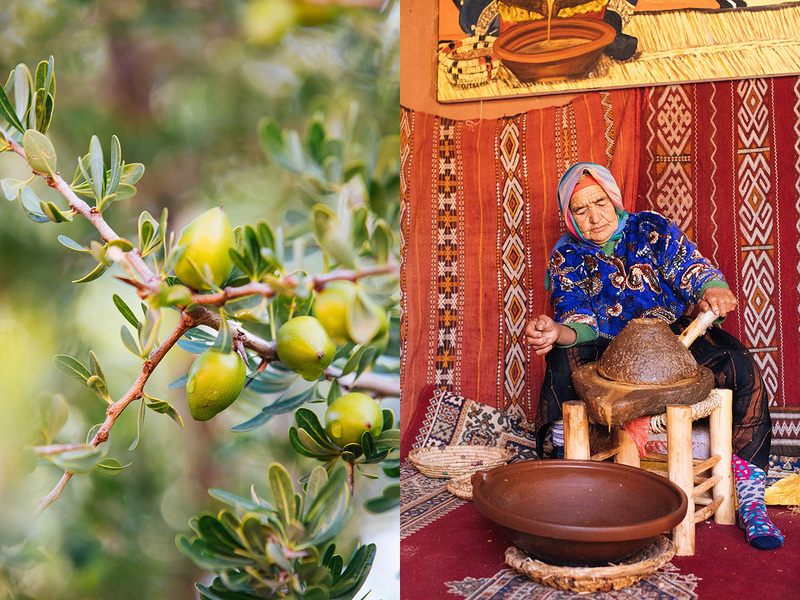 Part of the attraction of this tour was the chance to eat lunch with, and talk with, a real Berber family. 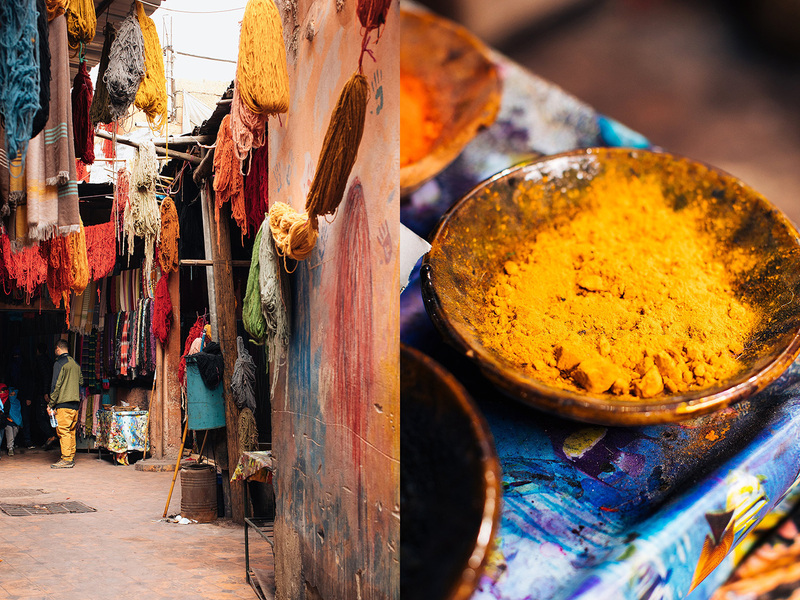 As three very curious travellers who always want to get to know the cultures we visit, we wanted to make sure we weren’t just taking in all the glossy tourist sites. We wanted to get to know some people, and understand their way of life. Perhaps because of the other tourists who had gone before us, or perhaps because they are used to larger groups, sadly our family did not sit with us to eat. 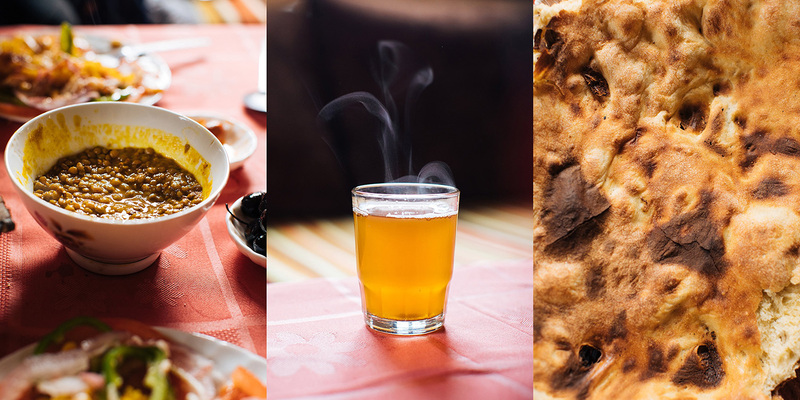 We had an incredible meal of kefta (it became our mission to try the local kefte in each town we visited), salads, berber bread and the sweetest mint tea you’ve ever tasted – but our hosts were too shy to join us. We get it. Once again here we are, strangers in their land (and in their home). Excited and clicking and buzzing at all we are seeing. It’s a lot to give of yourself like that. Sometimes you need to hold a little back. Karim’s uncle and cousin very briefly join us, and I’m able to get permission to take a photograph of his uncle Achmed. It’s only one of two portraits I’m able to get on this trip. If it’s not a street scene and I am making a portrait, I believe in asking a person’s permission. If I’m refused permission, I won’t take the photograph. I’ve been told no about 12 times in the space of 3 days – so I consider this to be my lucky break. Achmed is smiley and obliging and even asks to have his photo taken with me. As is often the way when I travel, I’m reminded that it’s often we the travellers who are considered exotic and different. 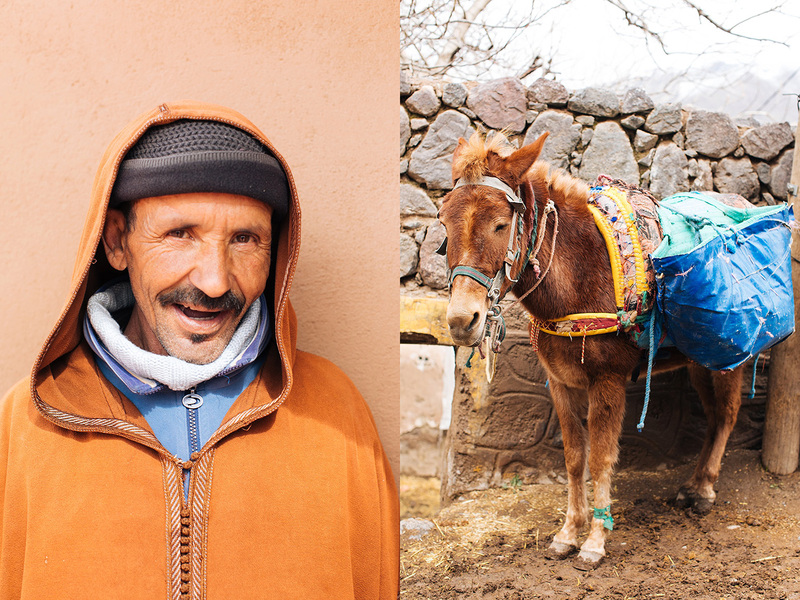 Karim’s uncle Achmed, and one of the many donkeys I developed a crush on. 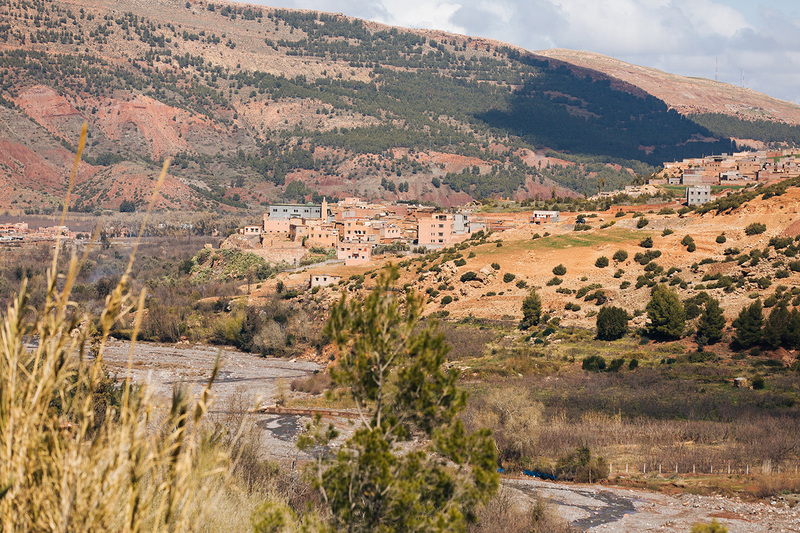 Our day in the Atlas Mountains is perhaps my favourite one of our days spent in and around Marrakech. 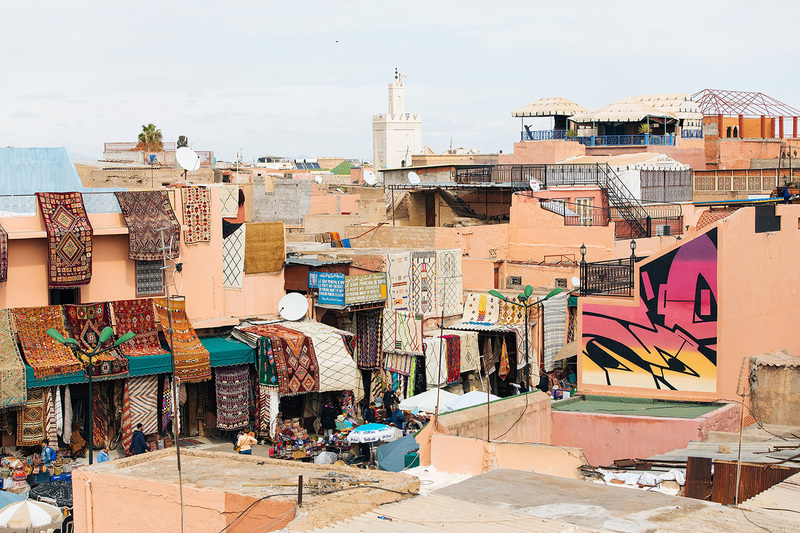 But that’s not to say that Marrakech wasn’t just as wonderful – it was. Arriving at the main square of Jamaa el Fna it’s a quick hit to the senses. Cobras are being charmed and monkeys are being paraded in football shirts for the tourists. But walk away from there (get a pomegranate juice at one of the stalls first!) 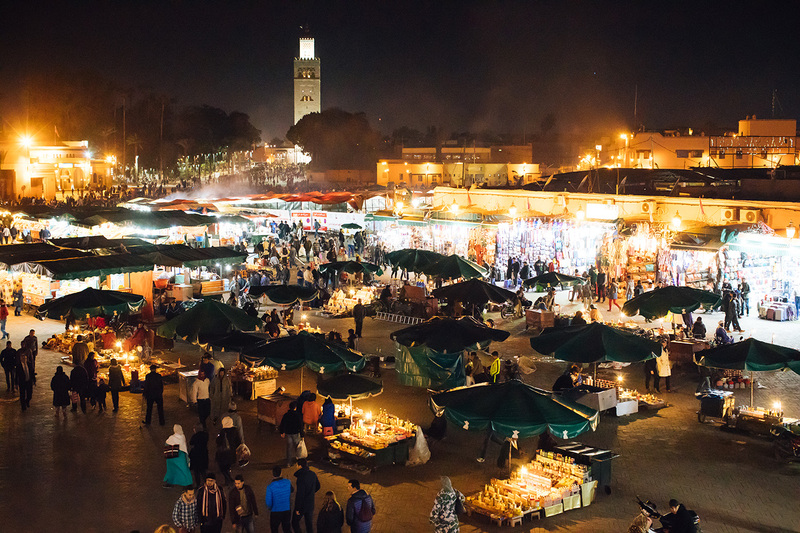 and dive into the souks and smile at people (without needing to raise your camera) and you quickly fall absolutely in love with this place – we did. I‘ve yet to get an accurate translation of this graffiti – if you are Moroccan & it makes sense to you, please do let me know! 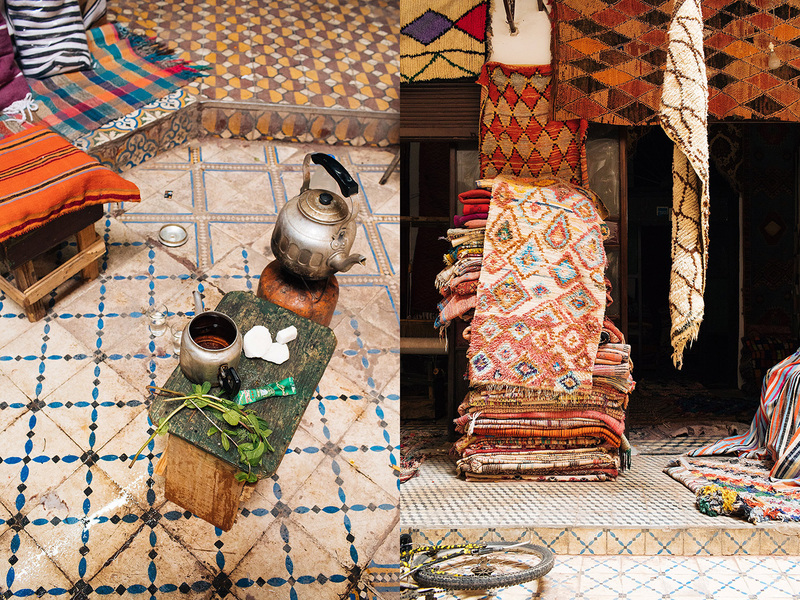 During an early morning wander, Daniel and I stumbled across this carpet store, down a dark alley. The owner let us wander around as he slowly set up shop and brewed his mint tea. And I am still kicking myself for not buying that perfect rug with the pink diamonds on it. Sometimes, being a good tourist means letting the stallholders dress you up. Even if they know you can’t buy anything. Daniel is dubious about the whole thing, clearly. Fresh pomegrante juice in the Jamaa el Fna. Jamaa el Fna by night. 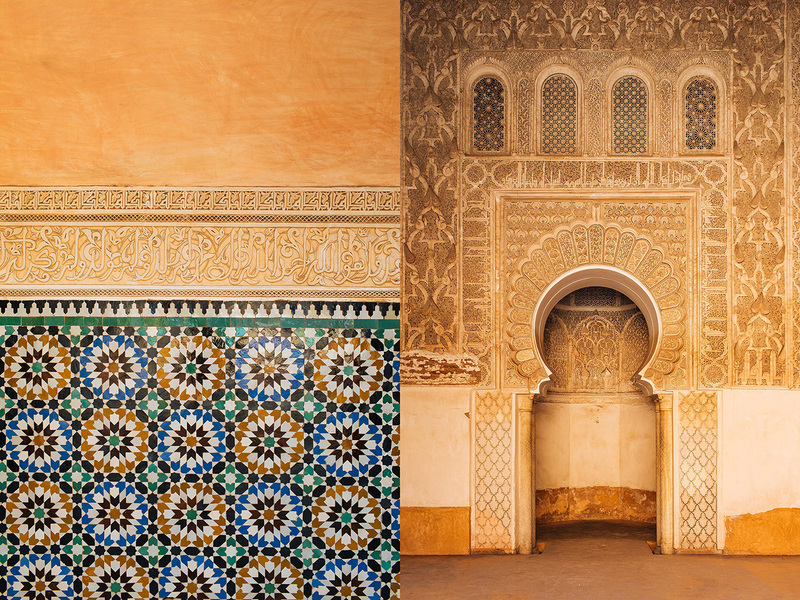 In my mind I see Morocco as having all the colour and incredible derelict architectural beauty of Italy, with the added calm sincerity of the Muslim people, and without the heaving amounts of tourists. Of course we weren’t there in peak season, and we were endlessly appreciative of this – it was warm but not boiling. Dressing respectfully was neither a hot nor uncomfortable task. And the ready kindness of the Moroccan people bowled us over. In other countries, perhaps, when walking through crowded markets or past stallholders trying to sell their wares, it becomes normal to just ignore the people calling you in. But we very quickly learn that here in Morocco it’s different. Shopkeepers genuinely do want to show you and teach you things. An honest claim of not having money to spend is answered with a “Welcome!” and a lesson on natural soaps, spices, or herbs will still ensue. It’s a good lesson for us all. We’re all human. Yes, a stallholder might ultimately want to sell you something, but more often than not they just want to chat. It can’t be that exciting standing in the same spot all day every day. A smile and a “No, but thank you!” is answered with a “No problem, welcome!” Telling a restaurant owner we really have just eaten is answered with “OK, have a beautiful day”. The lesson here: we don’t need to ignore each other. We spend the next 8 days smiling at everyone. 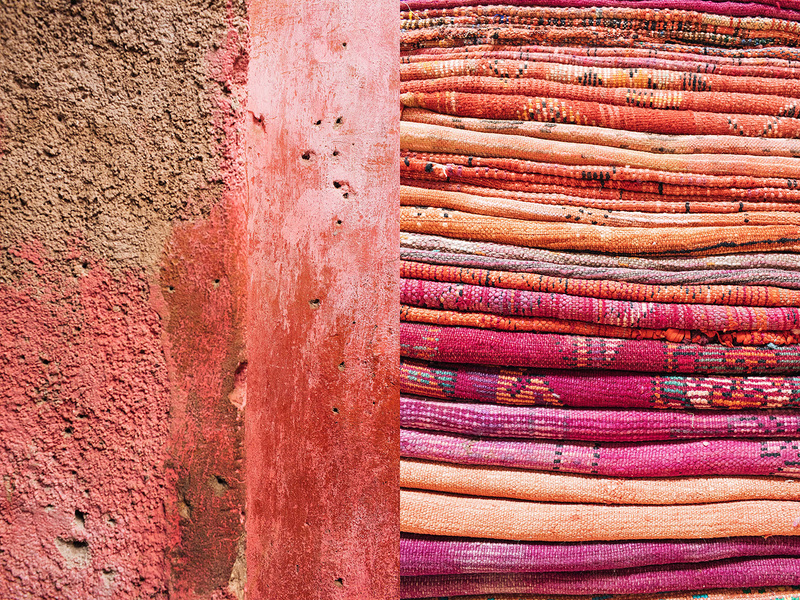 Dive into the souks. You won’t get lost. Within the souks are various handicraft areas, each with their own zone. 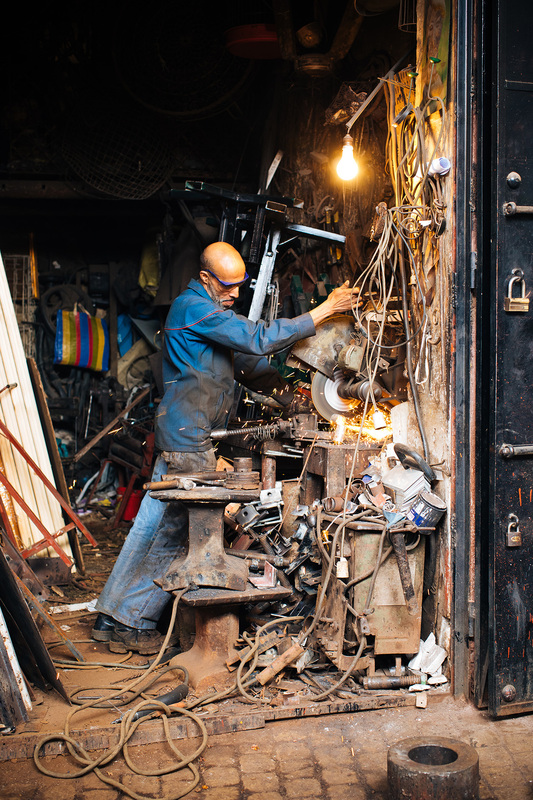 Walking around seeing people working with leather, wool, wood and metal was one of my favourite parts of the day. 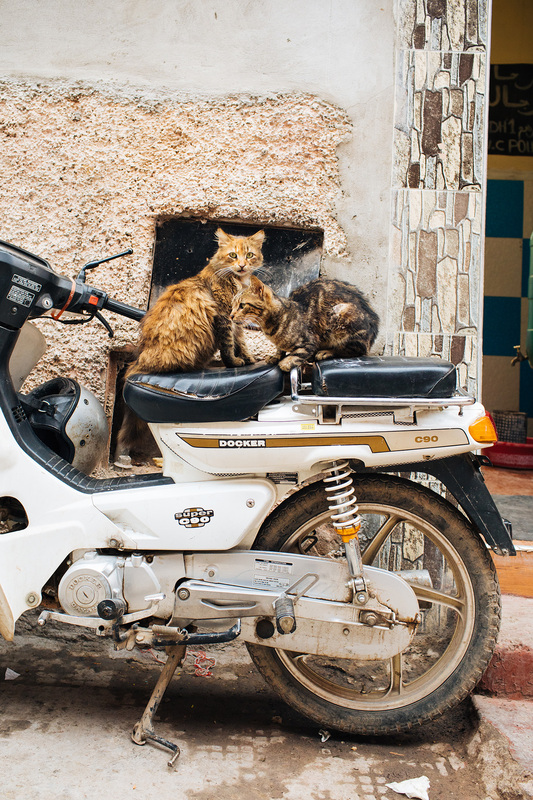 Fun fact: Cats are the favoured animal here in Morocco, and dogs are considered unclean (I cannot tell you how much this broke my heart, being the crazy dog-woman that I am. But I guess cats are OK too). The streets are littered with groups of cats and food is always left out for them. One day we came across a solitary kitten snarfing down a bunch of chicken heads from the local butcher. Lucky fellow. I didn’t eat chicken that day. My best advice for someone just arriving in Marrakech is to get up high, and then dive in deep. The city is covered with so many cafes and restaurants with roof terraces that you are spoiled for choice. Our research leads us to the very Instagram-friendly Cafe Nomad on our first afternoon, and whilst it’s definitely not the cheapest option, it’s also a lovely introduction to the city. 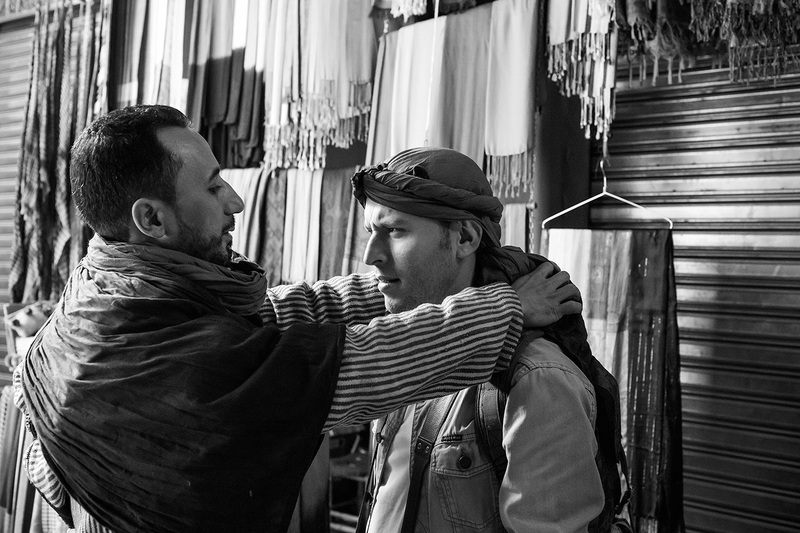 During the course of our three days in Marrakech we cover a lot of ground – all whilst taking things relatively easy. Our mornings are not rushed – breakfast and coffee always. We spend a lot of time just wandering around and being pretty pleased with ourselves when we find when can easily navigate ourselves through the souks. “This is chameleon corner!” “OK we should be coming up to the fruit and veg market, then we take a right”. “Right, if we go past the place we had lunch yesterday, we will have gone too far”. 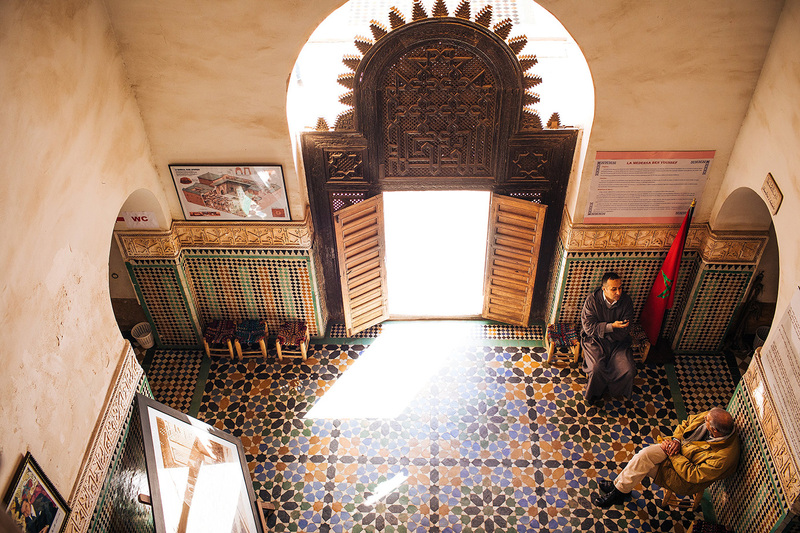 The front door to our Riad is the one with a jewellery seller right outside it – he’s often found sitting in a chair with a cat friend in his lap. We feel at home. These white markings on the walls around Morocco are actually the voting system! 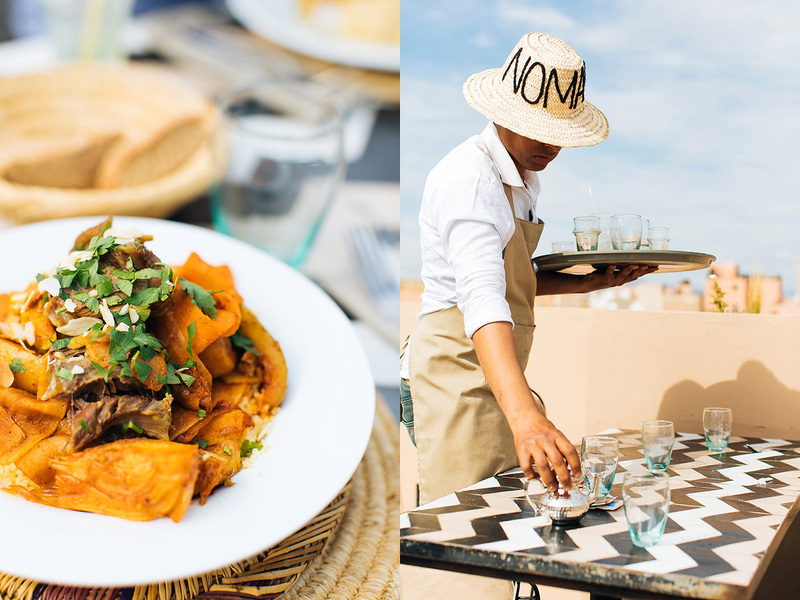 Lunch and a view at Nomad on our first day in Marrakech. Taking in tea and the view at the Maison de la Photographie. 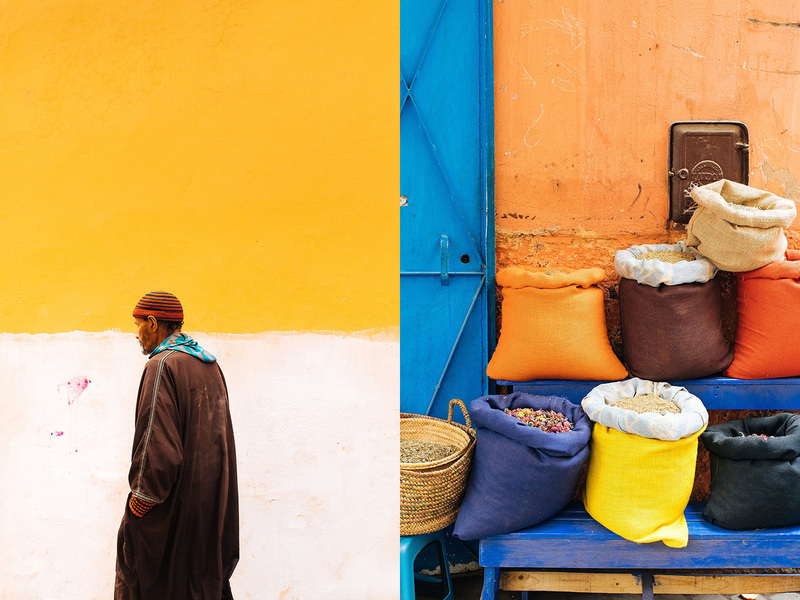 Morocco is a special kind of heaven for the eyeballs. 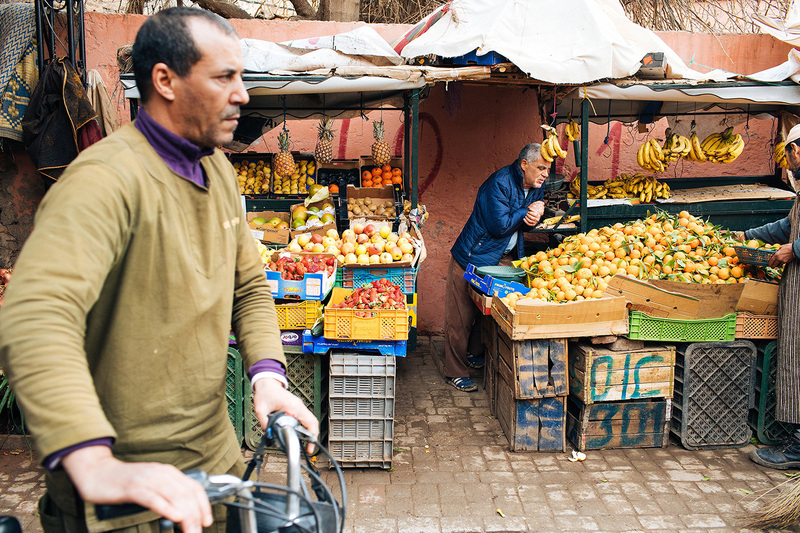 One of the fruit and veg markets. 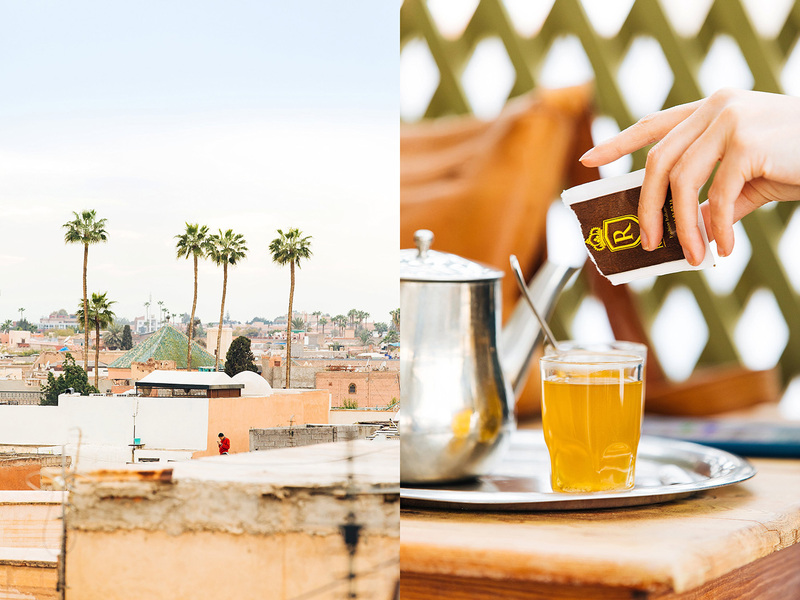 Three days in Marrakech is definitely doable. If we’d had time, we could have slowed down even more, perhaps visited a few more places, but really we never felt like we were tired or in a huge rush. We think we did it right, and by the time our 3 days were up, we were ready and excited for our next destination. 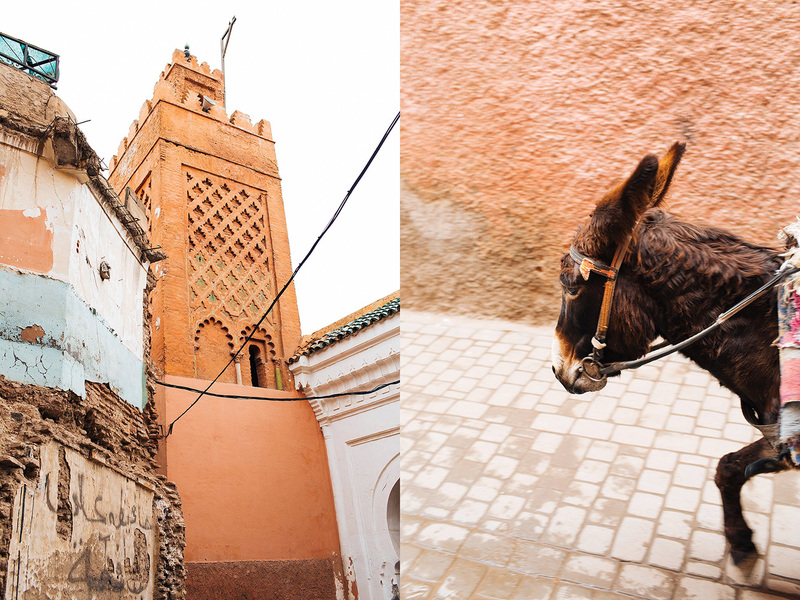 See below for the list of places we saw in our three days in Marrakech, and more images! 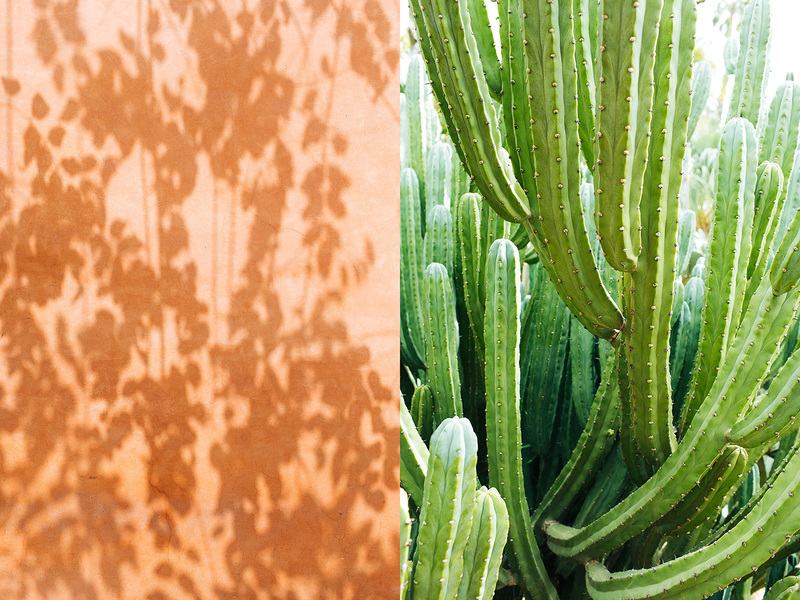 More mint tea and the beautiful surroundings at the Jardin Majorelle. The wool dyers section of the souk. Seeing all the different handcrafts being made was a definite highlight for me. Look out for scooters and donkeys – they rule the road. Former Koranic college Medrasa Ben Youssef. 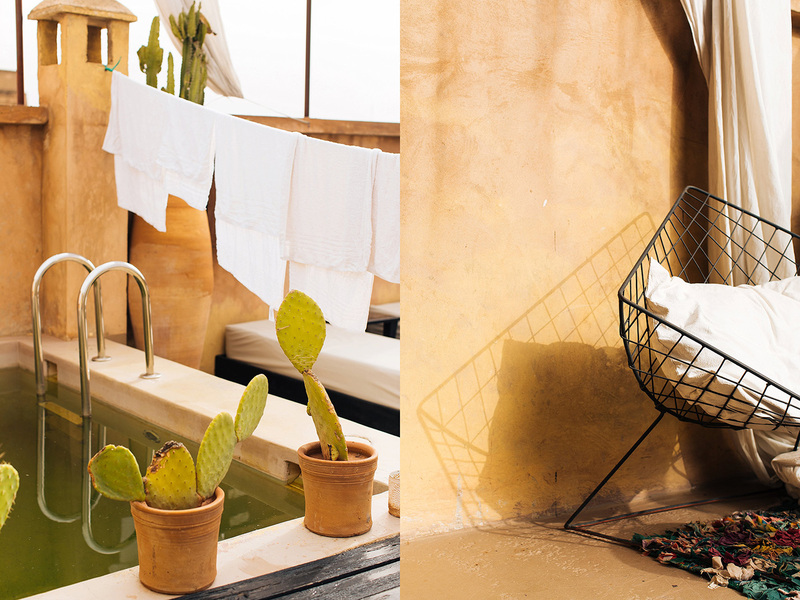 The rooftop terrace of Riad Lola, our favourite spot. 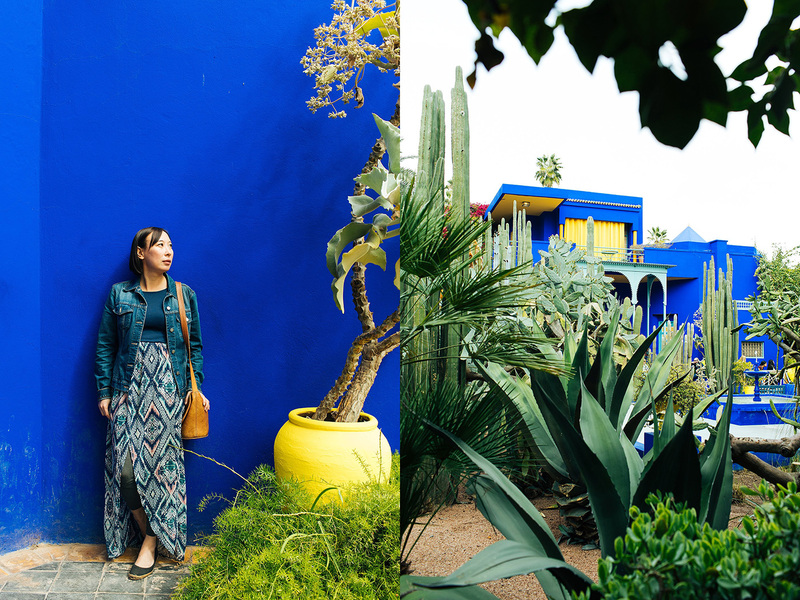 We visit the Jardin Majorelle (so much more beautiful and interesting than it ever seems online. How is that?) and make our umpteenth cat friend whilst taking mint tea in the cafe. 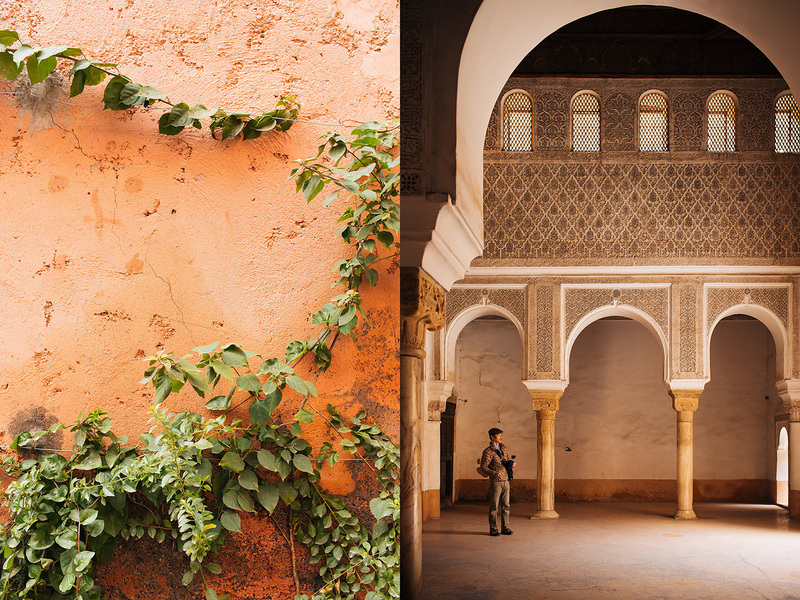 The Maison de la Photographie houses beautiful portraits and images of Morocco. We arrive late and tired so mainly use it for it’s lovely terrace and another mint tea. Terrace-and-tea-ing is important. 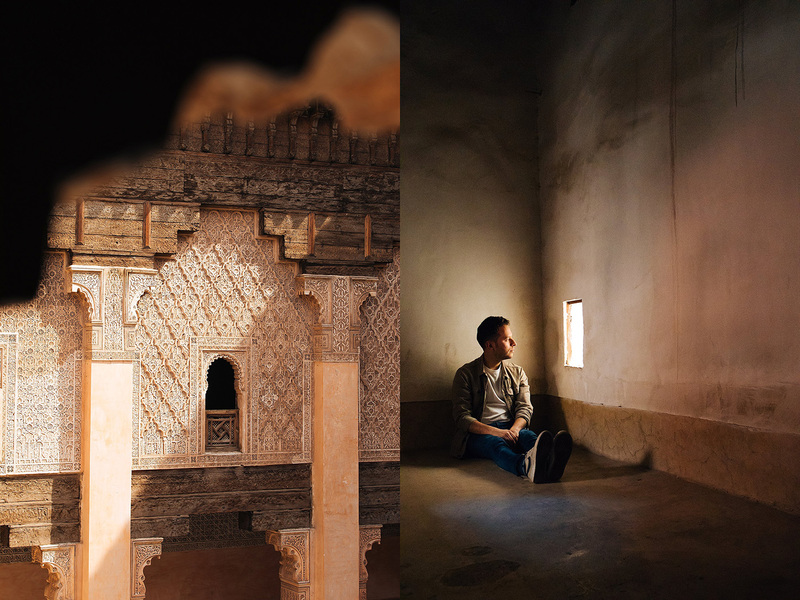 The former Islamic college of Medrasa Ben Youssef is a place to spend some time. 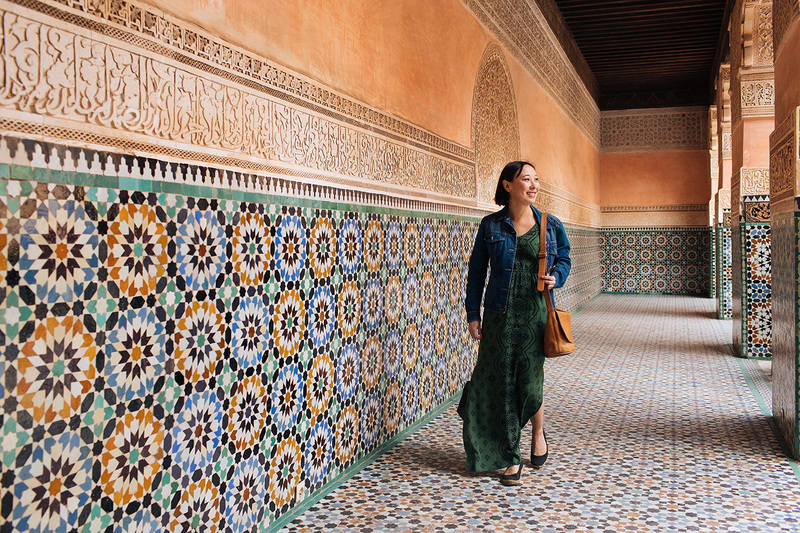 As with most places in Morocco, the outside might seem unassuming but the inside is stunning, and it’s lovely to take some time to wander around all the upstairs rooms, and take in the view of the courtyard from all different viewpoints. We ate at Cafe Nomad, Cafe Arabe (if like us you really felt like a glass of wine, here’s one of the places you can get one! ), took in the view from Cafe de France (but left in order to eat elsewhere!) and various other roof terraces across town. 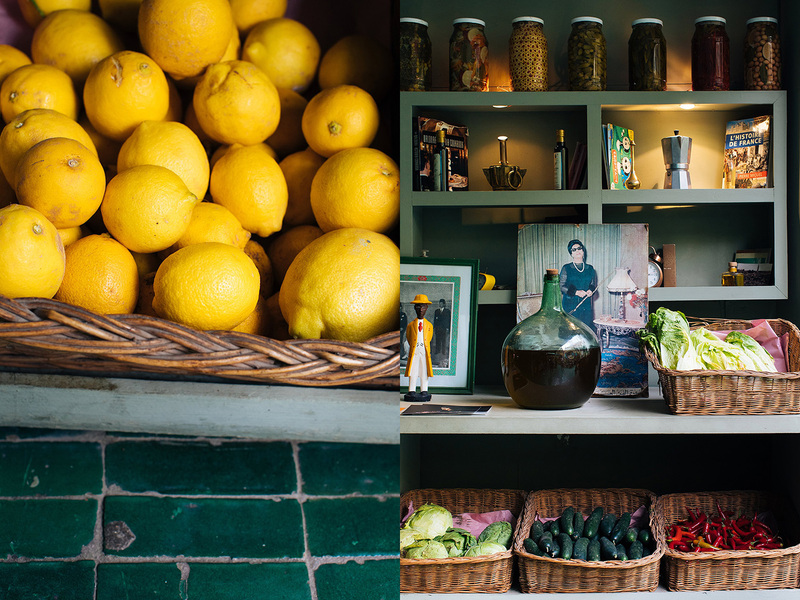 A highlight was the fantastic food (and courtyard) at Le Jardin. We ate at a bunch of other simple local places which I don’t have names of – but you can eat cheaply and cheerfully here. There’s no need to spend a lot of money, and the food is incredible. 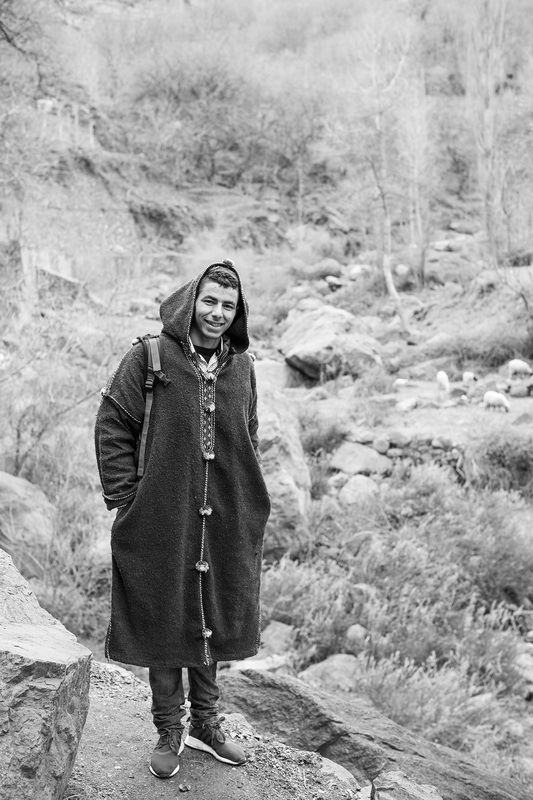 Our guide in the Atlas Mountains, Karim, was a total gem. If you’d like to get in touch with him and arrange a tour, you can find him on Instagram. He can also be can be contacted via email: karim.trekking@gmail.com. Alternately if you’d like to call him, please contact me and I’ll pass on his phone number! 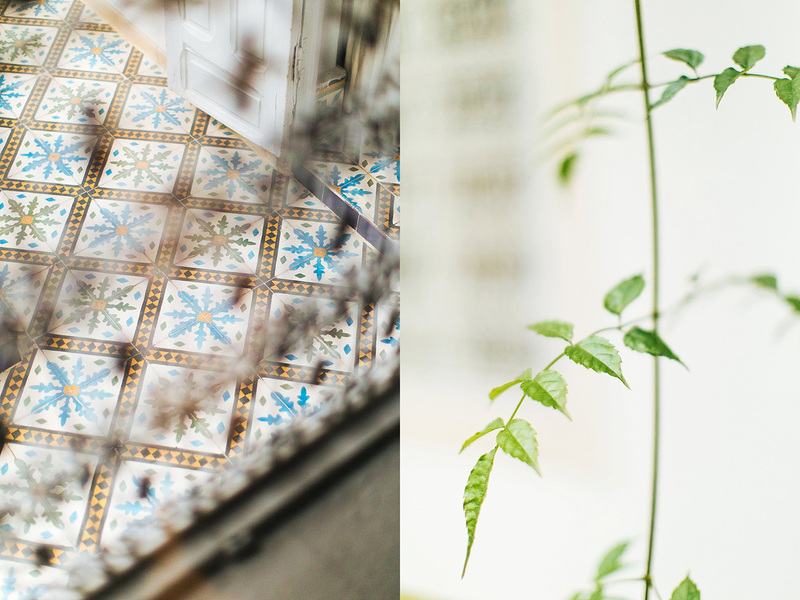 Last but not least, our Riad was just beautiful. 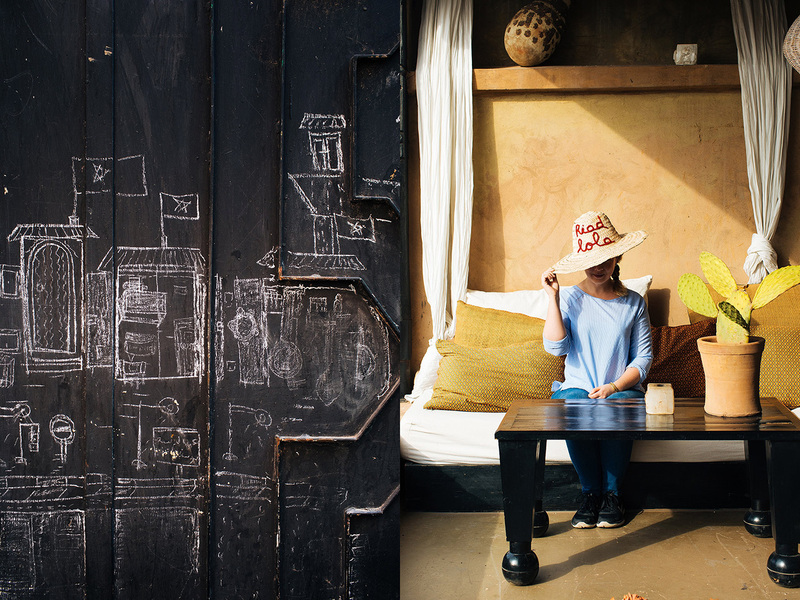 Lola, a native Spaniard who bounces between Barcelona and Marrakech, has poured her heart into this place and it is a beautiful, calm respite from the business of the medina. It’s furnished with a whole bunch of eclectic things which we all fell in love with (Daniel even tried to get her to sell him her rug). The three of us shared a massive private bedroom and bathroom (Top tip: set bathroom rules on the first day. Especially when your bathroom doesn’t have a door). Again, we weren’t paid to go anywhere, and nothing was given to us for free on this trip. But please go stay at Lola’s, it’s a little gem. I’ve been waiting for this post and it is even better than I expected. So so so beautiful!